The second Closed Beta for the upcoming first person action brawler Sky Noon begins! Starting at "high noon" (12:00PM PDT) through May 25 at 12:00 PM PDT, participants can take part in the beta test by joining the official Sky Noon Discord Channel and authorise the key bot in the channel. Sky Noon combines the fast-paced first person action with brawl play mechanics in a reimagined steampunk Wild West. In celebration of the Closed Beta, a Sky Noon Gleam campaign has also begun! Starting today on May 23 to June 22 at 11:59PM PDT, gamers can participate in the Sky Noon Gleam campaign for a chance to win prizes from Gunnar glasses, Logitech, and DX Racer. To enter, ‘Like’ the game on Facebook, follow us on Twitter, join the Discord, and add the game to your Steam wish list. Named one of the Best Indie Games at PAX East 2018*, Sky Noon takes place in a reinvented Wild West universe where the frontier floats among the clouds. Powerful cartels crave to control the most precious resource in the West: water. Players take the role of hired gunslingers that battle opposing fighters across floating islands in the sky. There are no health meters in Sky Noon; instead, to eliminate enemies, players use various super-power compressed air weapons to send them flying out of their boot spurs! Grappling hooks and lassos must constantly be used to prevent players from falling off into the great blue sky. Combined with other items like steam-powered jetpacks, jump pads, and teleporters, cowboys need to be quick on the draw and light on their boots in the fast-paced, aerial mayhem of Sky Noon. 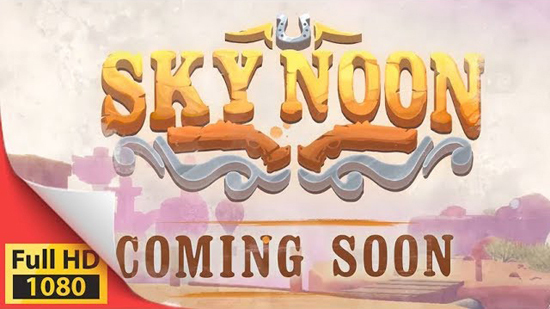 Sky Noon will be launching on Steam Early Access in early 2018.